After a football induced weekend of ribs and wings, my friend, Ann, called to say she was eating a salad of quinoa, chickpeas, kale and other vegetables too numerous to mention. Then she said she thought she might be becoming a vegetarian. I scoffed. But I did start to think about the vegetable. So everyone is foaming about Deborah Madison's new book, Vegetable Literacy. Saying something bad about a Deborah Madison book is like saying Virgina Woolf can't write. Don't get me wrong, I have nothing bad to say about the book. If there is anything bad to say about the book it is that the book is a bit overwhelming. It is not so much a cookbook as the Encyclopedia Britannica (Wikipedia for you folks under 25!) of Vegetable knowledge. 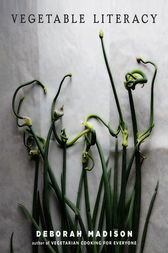 There are recipes for onions but not before a thorough plant taxonomy. Can one have their knotweed and nightshades too? Carrots yes, but one really should eat the tops, too. How the hell does one cook a cardoon? What is a cardoon? Why would one eat it? Well, Madison has a recipe for that. We tend to judge vegetable related works by the rutabaga recipes. Madison doesn't disappoint with three. Though she does seem to have a thing for peas. The recipes in the book do, indeed, make the vegetables shine. Speaking of peas... Don't go to the freezer. If you want some mushy peas to slap next to fries, be my guest. Want to cook peas with Deborah Madison you will need the real deal. Even Madison's peas are a thing of beauty. Heat the oven to 375 degree F. Lightly oil a small baking dish; a round Spanish earthenware dish about 6 inches across is perfect for this amount. We might just improve this recipe with a rib eye on the side. While we might eat our Peas with Baked Ricotta and Bread Crumbs with a rib eye, as a gardener, Vegetable Literacy is a joy. The more ideas for garden produce, the better. We are already anticipating our spring seed catalogues.